George Bailey was wrong. As it turns out, it's actually quite difficult to lasso the moon. And eating it? Forget about it. You'll chip a tooth well before you get to the "shooting moon beams out of your hair" stage. (Though that would be pretty cool.) No, the moon makes for a terribly impractical gift. I propose, then, an alternative. 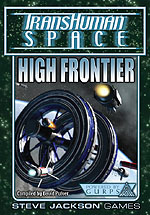 In lieu of the moon, Transhuman Space Classic: High Frontier. While it may not be the genuine article, it does have quite a good deal of information about our lunar lovely. It also goes on at length about all the junk that's floating around the Lagrange points. So in a sense, it's even better than the moon, since it doesn't just limit itself to one rocky spheroid. Also, unlike the actual moon, you can eat it if you print out a copy! Not, um, not that you should, honestly. But at least the option is there, which is more than you can say about the moon.